I have a question about quilting a quilt with sahing strips and narrow borders. I am doing a sort of panel quilt and before I did any FMQ, I SITD around all the panels. The batting I used said to quilt 2 1/2"- 4" So I shouldn't have large non-quilted areas. My question is: since I stitched on both seams of the border, do I need to do any type of stitching inside the narrow strips? Or is this sufficient quilting to keep the batting from doing whatever it's not supposed to do? I will try to take a picture of the piece that I have here if that will help. It should be quilted enough. Someone else may have a different opinion. When it says 2-1/2 to 4 inches, it really means in all directions.....so while the sashing/batting is secure along all edges of the blocks, within the sashing itself, there are still long areas that aren't secured at all....the batting there may shred when washed.....but this is just my opinion, take it for what it is worth. I've done many without additional stitching in the small borders with no problem. I use Quilter's Dream Select, so don't know about other battings. I would say that if you want to feel secure in your mind about it staying where it is supposed to, I might add a bit of something in the blue section. Any little waves, or a continuous line of hearts. After all your beautiful work, you don't want going into a lump in the first washing. I love the colors you picked, by the way. Great question - I was wondering the same thing. I see what you mean, Buckeye Rose - I've learned something from you today....thanks! Is that upside down? It's difficult to tell. It looks like your quilting should work well. Good job! I would do a simple stitch the length of the border - it is secure on the sides but not lengthwise. Actually, this is just a portion of a large queen size quilt. There is another piece that is a mirror image of this one and then a larger center panel. I am going to sew them together after I get the quilting done and then sew down a strip of the darker blue over the seam on the top. I've been working on this thing off and on for more than three years. This isnthe year to get it done. 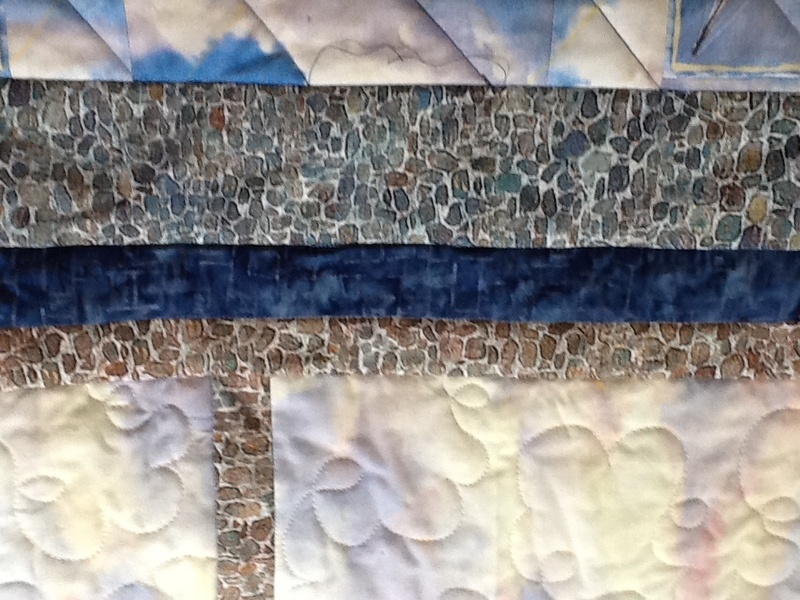 The quilt I'm working on now has a narrow strip in the border. 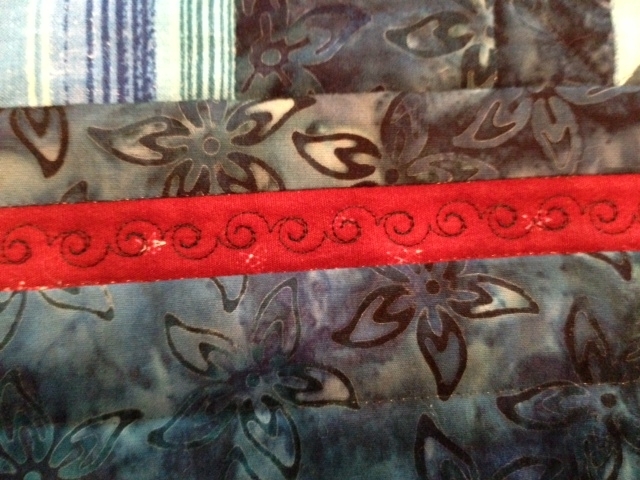 I decided to try out one of the decorative stitches on my Bernina in a contrasting color. If you don't want the contrast, you could match the thread with the fabric. I would think if you SITD around all the panels, that would be enough. Maybe something like loops or zig zags. It would be totally up to you. Check your batting. 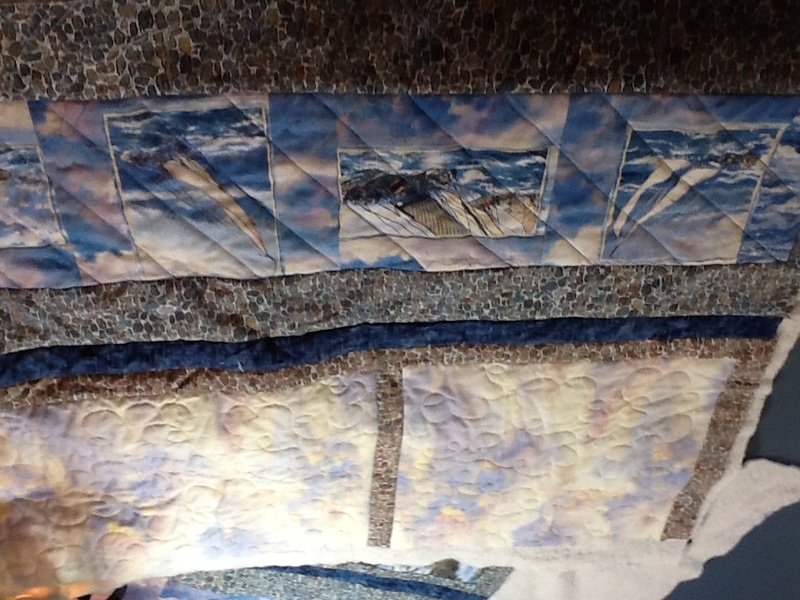 It will tell you how far apart the quilting needs to be to hold up and not bunch. I really like what you have done so far, and would recommend you put additonal quilting as needed. I know most batting is between 3-6 inches apart. Thank you for asking this question. As a new quilter I had never thought of that. I will be watching all the answers from the "experts". Thanks again for asking this question. I guess I quilt a lot heavier. I'd suggest that your 'pebbles' fabric be quilted a bit more. I would make rectangles, about the size of my palm. It wouldn't take a long time, and it would continue the concept. You would make it look like a rock wall. I would not make the rectangles have sharp corners, I'd make them rounded. For quilting motifs, I have a card file that has many different motifs, for free motion, I divide them up into rounded, meanders, feathers, sharp points, etc. I've found that it really improves my quilt if I add various related motifs. I've just been doing the "channels". I had been doing wavy sort of diagonal cross hatching, then "somebody" said don't let a line of quilting cross another so I quit.